We maintain our log home is good shape but it was time to have the exterior refinished. This is the first log home we have owned so we were unsure of what would be required to return it to its original beauty. We researched the care and maintenance of log homes very carefully. It became abundantly apparent that only power washing and re-staining would be penny wise and pound foolish. The Log Doctor has a five step process that gets down to the original pristine wood surface before they apply a high quality stain and then a sealer. This is done by power blasting with finely ground corn cobs, then hand grinding, then power washing and then high pressure air blasting every square inch of the log surfaces. They also replaced our porch railing to maintain the original authentic character of the log home. The job has been completed and our log home looks like new. The Log Doctor crew was professional, knowledgeable, diligent, trustworthy and took great pride in their work. They were also the hardest working craftsmen and women we have ever encountered. They also kept the work site impeccably clean every day. We are thrilled with their work and recommend them highly. We could not be more pleased with the result. Our 3,000 sq foot home in Silverthorne was in desperate need of restoration. The log siding was absolutely black with deep cracks. Rudy's crew got in and removed all the black, sanded every single log, stained and restored the entire home and decks. These guys are obviously experienced professionals. They cleaned up the entire property every day. We could not be happier with the outcome. We are truly proud home owners again. Thank you Rudy and Log Doctor. outstanding attention to detail. They clean up daily and we're extremely nice, conversant and worked hard (about 12 H) per day to get the job finished. 5 Stars!!! Rudy was very good, he honored his word, was punctual, polite and respectful and we were very pleased overall and will use him again. We have been very pleased with The Log Doctor's work. They have done two jobs for us. The crew are careful, friendly and hardworking. And both jobs were very well done. Our house looks great! Rudy’s integrity showed the first time we met him. We knew immediately that every word he said was truthful and that he would follow through with everything he told us. He explained the process of re-finishing my father’s log home, answering all of our questions and showing us a sample of what the end product would look like. Rudy’s team did follow through with everything Rudy promised; and by hand. They were hard workers and they were precise. Every log and chinking was completed to a brilliant finish. The log home looks brand new. We would hire Rudy again and we highly recommend him. We recently completed construction of a new log home in the Grand Lake area. The project came with many surprises, some good and some not so good. One of the bright spots in the complete construction process was the crew from the Log Doctor. Rudy gave us a schedule when he quoted the job and they finished the job almost exactly on the day he said they would. We used them for both staining and chinking and not only did they show up on time every day, which we found was not the case with most subs, the quality of their work was second to none. I would like to enthusiastically recommend Rudy Mendiola and his company, Log Doctor. He recently completed the restoration of my deck in Eagles Nest. He and his workers were meticulous both in the evaluation of the necessary repairs and in their work. As with many home repairs, as the work begins one discovers that the repair needs to be more extensive than the original assessment. The best products and approaches were recommended and while necessarily somewhat more expensive, I feel the job was done right and will weather the extreme conditions here in the mountains. Plus it looks just GREAT!! ! Many neighbors have complimented the improvements and I am looking forward to enjoying the outdoor space for years and years to come. I hired The Log Doctor to refinish my badly weathered log home last September and I’m very pleased with the results. My home looks new again. From the corn cob blasting, through grinding, staining and chinking, their employees were considerate, thorough, hard-working, pleasant, and punctual, getting the job done as promised. They not only delivered what they promised, they clearly care about the quality of their workmanship. When we called for an estimate Rudy came out and very carefully assessed our home. He didn’t give us a cookie cutter formula to restore our hand hewn cedar siding but instead talked with us about our goals and the best methods to achieve them. Our other estimates had talked of a simple power wash or cob blasting, but neither would have maintained our special finish. If you need new construction or log restoration the Log Doctor is the guy to call. I needed my deck replaced including a 120 feet of log railing. The Log Doctor's bidding process was not only detailed and timely but competitive. The work was completed according to schedule in a very professional and attentive manner. The Dr. was on site daily to answer any and all my questions and concerns. The attention to detail was impeccable. I highly recommend the Log Doctor. The Log Doctor LLC worked on a large project of ours in Summit County, Co. They performed the job smoothly and with attention to detail and in a timely manner. We were very pleased with the final job outcome. Serving Summit county and surrounding areas since 1972. The Log Doctor has worked on two of my projects. 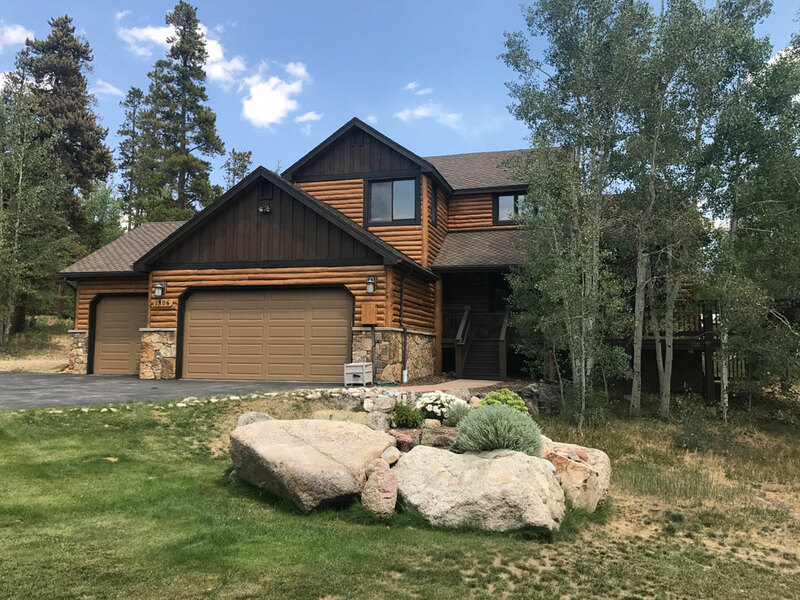 One a large home in the Hamilton Creek subdivision in Silverthorne and the other was a large log cabin in the Eagles Nest subdivision, also in Silverthorne. Rudy certainly paid attention to the detail and the agreed scope of the projects. The Log Doctor restored the exterior of my Colorado log home. Rudy and his people did a tremendous job. They removed all of the old stain and chinking and restored the logs to brand new condition. The new chinking also looks amazing. Rudy and his people were highly professional and the end product he delivered was spectacular. The job was done professionally, on time and on budget. I would highly recommend The Log Doctor for your log home project. The Log Doctor did a wonderful job staining, re-chinking and replacing log siding on my log home. He used top-grade materials and his crew did a thorough, professional and timely job. I am not one that typically writes reviews but I was so impressed with the work that was done that I wanted other Summit County residents to know about this terrific contractor.